Parapat is on the foreshore of Lake Toba and is where you catch the ferry across to Samosir Island in the middle of Lake Toba. In the 1920s Parapat became a holiday village, with many of the bungalows belonging to the European plantation owners in Medan and Berastagi. In 1948, Soekarno, Hatta and Agus Salim were imprisoned in 'Villa Marihat' in Parapat. This house is still open for public viewing. Nowadays there is nothing of great interest in Parapat apart from being the ferry port to get across to Samosir Island on Lake Toba. There are quite a few travel offices in Parapat which can exchange money or organise bus tickets or tours. 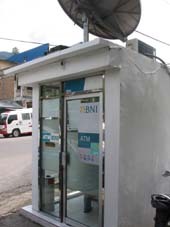 A Bank BNI ATM machine is located at the top end of the main road which accepts international ATM cards and the booth is air-conditioned! Further down the road is a Bank BRI office which has a Western Union office within for money transfers. 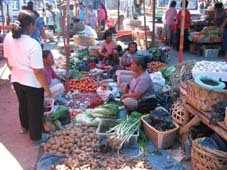 They have a fresh fruit and vegetable market on every Saturday morning next to the ferry wharf. The last ferry across to Samosir island leaves at 7pm in peak tourist season and 6pm off peak. Ferries start at 7am. Price for crossing to Tuk-Tuk is 7000Rp. 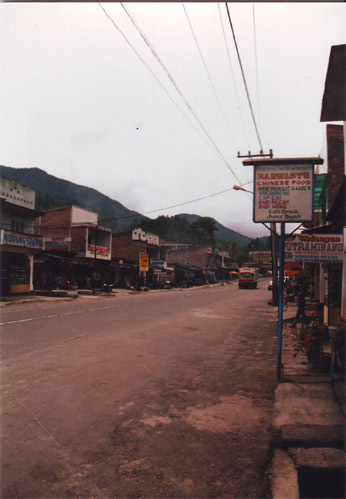 The main road running through Parapat is the Trans-Sumatran Highway. From here there are regular public buses going to Siantar. In Siantar you can change buses to go to Berastagi and on to Medan. There are also buses going to Sibolga where you can catch a ferry to Nias Island. The bus from Parapat to Sibolga take 4 - 5 hours. There are also buses going to Bukittinggi which can take up to 17 hours. There are a number of nice/average hotels in Parapat located on the lake looking over to Samosir island. Charlie Bar and Restaurant, right next to Parapat's ferry wharf has good budget rooms. Rooms from 30,000 - 40,000Rp. Internet access for 17,000Rp per night. For pics and contact details click here. Hotel Sedayu. Located on the Trans Sumatran Highway at the top of Parapat. Rooms from 79,000Rp per night. For pics and contact details click here. Hotel Wisata Bahari. Right on Lake Toba, close to the Highway that runs through Parapat. Rooms from 190,000Rp per night. For pictures, prices and contact details click here. Prices from 479,160Rp in low season or from 608,630Rp in the high season for a standard room per night. Great views of Lake Toba from the hotel.